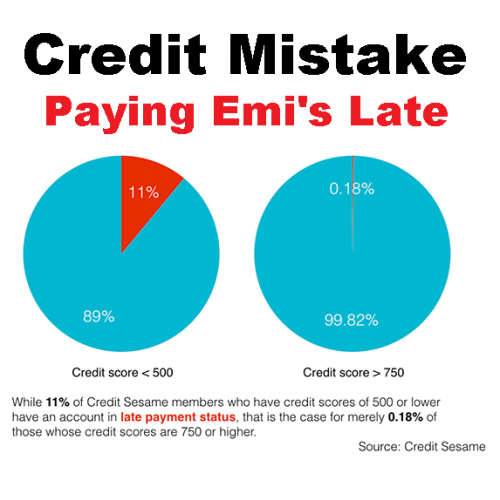 Missing A Single Payment  Will Affect Your Credit Score? These types of issues would have flown as banks could not collect details about a person from other banks and would just give loans or credit cards based on the data provided by the borrower. Now with the operations of Credit bureaus like Equifax it has become easy to track a person’s credit history. The type of missed payment and later paying of dues within 90 days after due date is called a minor default. With this type of offence, your score will take a hit, but you can make up by paying future payments on time. On the other hand, if you do not pay your bills after the 90-day period it becomes a major offence, due to which your credit score will take a big nose dive. With worse statements like “settled” or “written-off” against any credit account with hit your credit score hard. It will become almost impossible for you to get a loan or credit card in the future. It will take time and a lot of hard work to improve your credit score. Whenever you borrow money from banks or NBFCs, they update your payment history to the credit bureaus. On the other hand, when a person applies for new credit, the lender can check about your payment history if you had already utilized credit in form of loans or credit card bills. 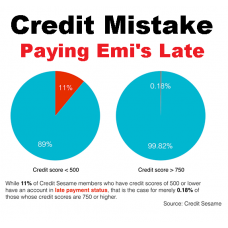 Based on your performance, your credit score is calculated. This score will vary from bureau to bureau based on their calculation method and weightage given to various criteria. So, do not worry if your score is less with one bureau and higher with another. Now let us see the factors that affect your credit score, knowing them is instrumental in understanding the importance of delayed payments. As you can see payment history is one of the most important factors when calculating your credit score. Without good credit score, you will not get credit, or you will pay more for the credit for which you could have paid much less with a good credit score. When it comes to financial matters it is always best for a person to be prudent. One should never miss any dues and always make payments in full to make sure they do not suffer when they really need credit. There are four credit bureaus licensed to operate by the RBI in India today, namely CIBIL, Equifax, Experian and CRIF High Mark. With CIBIL being the oldest, a credit score has become synonymous with a CIBIL score. Personal Loan For Cibil Defaulters In MumbaiThe single most important tool used by a lender to evaluate your application for any loan or credit card is Your credit history, other than your income. before approving your applications for credit cards and loans Banks check your credit report and score. it's important that the information included in Cibil is accurate and positive Your credit report affects many aspects of your life. Lenders consider you a greater risk if you have a low ..